This video baby monitor will ensure you can see every angle of your precious kiddo as they eventually climb the crib! 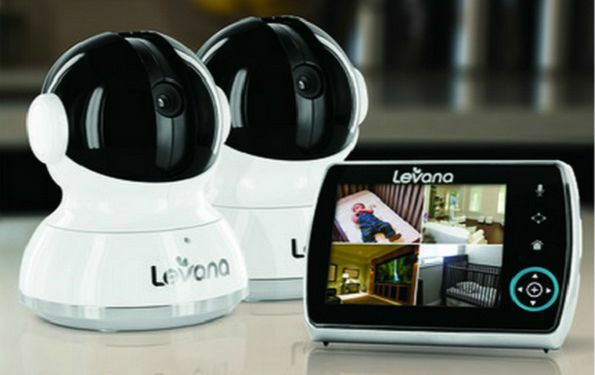 Check out the Levana 2 Camera Video Baby Monitor. Retailing at $300, Shop.ca has put this item on sale for $149.99. Use our new exclusive coupon MOOSE50OFF125AUGUST and you can save an additional $50 off your purchase, bringing the total price down to only $99.99. Free shipping with no minimum is included every day at Shop.ca. This monitor with dual cameras is fully stacked with features and is a great choice if you want a monitor that can do it all. Video monitors can be super handy to make sure your kid is safe and comfortable. The model can tilt, pan and zoom using both cameras. The base of this camera can take pictures and record video in case you catch a particularly adorable moment. The battery lasts for ten hours but does have a pretty cool mode they call peep mode. If you set the camera to peep mode, the video goes off until it registers a sound in the baby’s room. This means when you are sleeping, that bright light is not in your eyes unless the baby needs you. This monitor also has a two-way communication system, so you can communicate with someone else helping with the baby, or even try using your voice to sooth the baby before you head back into the room. Included are also three lullabies you can play for your baby, night vision and a lighted indicator ring on the base that changes colour depending on how loud and urgent the coos or cries are. I think Shop.ca has inflated the initial price on this monitor a little, but this is still a great deal on a monitor full of features. You could pick up this monitor for $149.99 at Amazon.ca from a secondary seller. I also found it priced at $149.99 USD From MyLevana.com. I found this same model priced at $133.24 on sale currently from Best Buy Canada, but this version only has one camera instead of two so your view will not be as clear. I also found a similar Levana model named Stella with two cameras that are available from Costco.ca for $219.99. Great purchase, peace of mind! Picture quality is excellent, battery lasts a long time, and the wireless range lets me go outside and still see/hear my little boy while he naps. I really like the ability to move the camera from the screen when he moves around! This camera is a solid buy and includes lots of extras. After having my first, I would not hesitate on making sure I had a good quality video monitor with a second child. I purchased a LEVANA baby monitor in the past and it interferes with my Internet connection all the time. If you plan to use the internet (laptop/tablet OR iphone) while the monitor is ON, you will keep losing connection. My husband (IT tech) and I couldn't figure out what was going on, but low and behold it was the darn baby monitor. So beware if you buy this brand! Oh no, did you reach out to them and see if they could help? I know that some of them have alternate frequencies and channels that you can use. Thank you - bought this set and we are very happy with it. Julie - did your hubby change the wifi channel? It doesn't interfere with our household wifi at all - we are both IT techs, and with a previous device that caused interference, we simply changed the channel our wifi was running on (since you typically cannot change the baby monitor channel).